I’ve avoided posting about this little mishap for over a month now because I don’t want to admit that I’m actually that clumsy. Backstory: We were on a cruise to Hawaii and, on the third day of the cruise, I was innocently reading in the cabin. When I stood up to go get some water (or something), I barely noticed that my foot was asleep. And, when I took a step, my foot/ankle sorta “rolled”. Before I could correct it, I heard a loud “POP” and instant pain. Turns out that my fibula broke, right at the ankle. 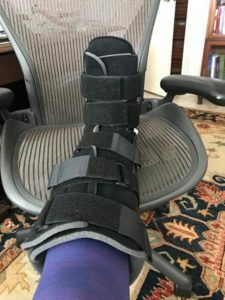 Ship’s doctor was great … x-rays, pain pills and a cumbersome “moon” boot. Ship’s customer service was too: finding us an “accessible” cabin so I could take a shower instead of crawling over the edge of the tub. Needless to say, I spent most of the cruise in the cabin … watching movies, reading books, watching others go on shore excursions. After nearly two weeks, we finally arrived back home and I went to see an orthopedic doctor here. He took more x-rays and fitted me with this walking boot which is a lot more comfortable than the “moon” boot. That was three weeks ago. Expecting to stay in the boot for two more weeks and then, possibly, rehab. Let me say something about the swelling … I never expected it to last so long. In fact, my ankle, leg, foot are still slightly swollen. And bruising? There was the requisite purple, blue, greenish yellow and the bruising is still evident. Lesson learned? Don’t walk (or try to walk) on a leg/foot that are asleep.